There’s a story behind everything, even a math problem! In our ‘Math Stories’ worksheet, kids need to read each sentence carefully, represent it pictorially and solve the math equations at the end of each story. 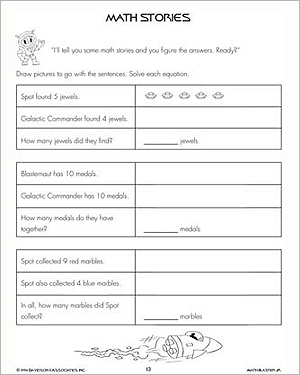 This fun, printable math worksheet primarily focuses on addition. Give kids this worksheet to solve and watch them sharpen their math as well as artistic skills!